special guests on Scottish Salmon Fishing. The Scottish Salmon Fishing Podcast is Scotland’s first and only podcast dedicated to salmon fishing in Scotland. The podcast is in association with Salmon Fishing holidays Scotland. 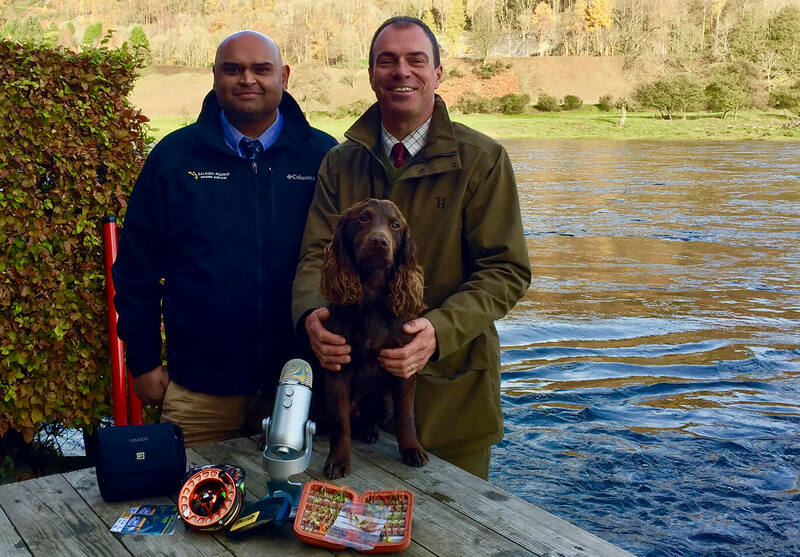 This podcast is presented by Sandy Datta (Director of Scottish Salmon Fishing Surgery www.scottishsalmonfishingsurgery.com & Salmon Fishing Holidays Scotland) and Andrew Gunn (Head Ghillie on the Newtyle Beat of the River Tay). Together Sandy and Andy have over 60 years of salmon fishing experience in Scotland and abroad. The aim of the podcast is to keep listeners up to date with the latest news from the Scottish salmon fishing scene and have interesting, controversial and lively debates on various issues around the sport. As well as this, there will be helpful hints and tips for listeners and interviews with well-known guests on the show from the salmon fishing world. Listeners will also have the chance to ask questions via the Scottish Salmon Fishing Podcast Facebook Page. Hopefully, the podcast will encourage new faces on to the riverbank as well as igniting passionate debate from listeners already enjoying our wonderful sport. Salmon Fishing Holidays Scotland design bespoke tailor-made salmon fishing holidays. From arranging salmon fishing on some of the most productive and exclusive beats in Scotland to organising accommodation, transportation, tackle hire and fishing guides, Salmon Fishing Holidays Scotland truly take care of all your needs. Therefore once you arrive in Scotland, you can sit back, relax and look forward to a salmon fishing holiday that will live with you forever! We hope that anglers who are planning to visit Scotland and fish for salmon find the podcast interesting and entertaining. Hopefully, they will also get a useful insight into what it is like to salmon fish in Scotland and also gain some knowledge into what tactics work well on the various rivers around the country. The Scottish Salmon Fishing Podcast is a must listen for any keen salmon angler. We hope that listeners find the podcast informative and entertaining and we look forward to your company. In this episode, the Scottish Salmon Fishing Podcast hosted by Sandy Datta & Andy Gunn has an interview with George Doull the head ghillie on the prolific River Thurso and gives you an insight into this very special Highland River. In Episode 2 of the Scottish Salmon Fishing Podcast, Sandy & Andy Give top tips and advice on how to get the best from your Spey casting when fly-fishing for salmon. Sandy Datta and Andy Gunn Kick off the new Scottish Salmon Fishing Podcast show. In this episode, they discuss the 2018 season and the many challenges it presented and also have some debate on catch & release. Prove your not a bot. What is 19 + 15?